Organic Pet Beds | Buckwheat Pet Futon | The Organic Mattress Store® Inc. The Organic Mattress Store has been selling these pet beds for 15 yrs.If you’re like most people with a pet, your four-legged friend is a member of the family. That doesn’t mean that you want him or her on your furniture or in your bed. It does mean that you want the best products available to help make your pet comfortable, especially when you aren’t at home. Organic pet beds are great for your furry companions because they lack the chemicals that other beds contain. These chemicals could harm your pet’s health over the long run. 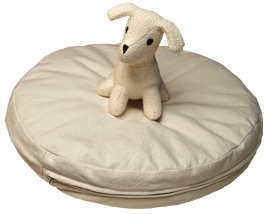 Getting an organic buckwheat pet futon will protect your pet’s health while providing for a great place to rest. Ask about our cat beds we put together from organic scraps upstairs. Protect your cat or dog from the harmful chemicals in conventional pet beds with pure and simple materials. Filled with certified organic buckwheat hulls, this healthy bed also has cotton batting, that is certified organic. As much as we love our beds, so do our pets. Beds come with a removable washable cotton canvas zipper cover. Your pets health is important to us. Cats and Dogs love to push around the buckwheat hulls and make a spot for themselves.